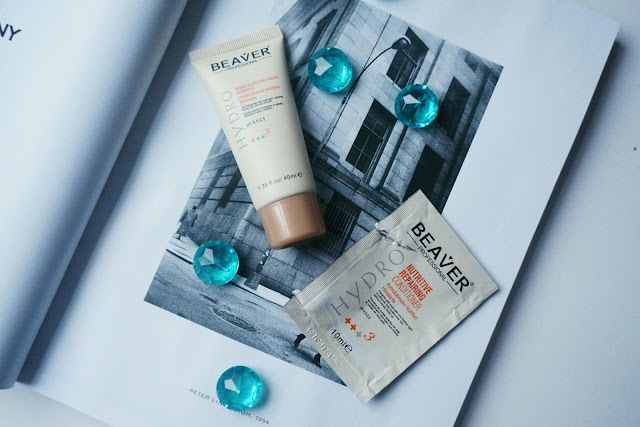 In my recent OCTOBER BIRCHBOX I received the Beaver Professional Nutritive Shampoo and conditioner to test out. The Beaver Hydro Nutritive series contains amino acids and vitamins with 16 kinds of vital amino acids to repair damaged hair and prevent hair breakage. The shampoo gently opens and purifies hair cuticles, providing necessary nutrients and doubles the moisturising effect for dry hair, strengthens and rebuilds damaged parts of the hair leaving longer lasting shine and elasticity. The conditioner to prevent lost of moisture by binding moisture molecules, smoothes hairs leaving your hair moisturised and strong and helps prevent split ends. So before I forget the results, I decidedly to quickly pop this down. The instructions on the package directs us to : use a decent amount to cover the whole head which will gently cleanse and restore the hairs condition and massage throughly. First of all, I don't usually read the instructions on shampoo and conditioners and slap it straight into my head, but I did for this one. Secondly I wash my hair during the night to prevent a headache - a method for anyone who suffers from headaches. For application, I squeezed a 10 pence blob onto to my hand and rubbed the product between my hands to create a slight lather, there's wasn't enough product so I put in another blob to cover the whole of my hair. Don't expect the shampoo to create bubbles, it is not designed for that but to create a slight lather. The shampoo really sunk into my hair especially my ends and within seconds I already felt my ends becoming much stronger and easier to comb through using my fingers - bearing in mind I can never ever do this with any other shampoos before. I left it on for an average time and then rinsed thoroughly with water. My hair already felt really strong after one shampoo application and moved onto conditioner. The conditioner is creamy and has a soft texture which instantly helped restore my hair and I had a very reasonable amount that covered my thick hair from root to tips. I felt that this really locked in the moisture and definitely strengthened, using a tangle teezer I ran this through my conditioned hair and then rinsed off. My hair was extremely smooth afterwards. After I blew dried my hair I instantly felt a difference, my hair was extremely lightweight, smooth, stronger and my frizzyness was more tamed. The next day may hair was still glossy, smooth and easy to comb through using my fingers and stayed extremely lightweight. Even now with my hair in a bun, it does not feel heavy and has a healthy glossy look. The only bad thing is it made my hair flat as it was extremely smooth - nothing a good texturising spray can't fix. Would I recommend this? A definite yes! If you don't have a Birchbox subscription feel free to use my referral link here. Have you tried this product yet? Until next time! That sounds amazing. Thanks so much for reviewing it really helped me decide on this product! I just used this tonight and have noticed my hair feels really soft! fortunately my hair is so big and frizzy there is no way it can look flat but I'm sure that is annoying! I would love to receive this sample for my hair type in which will be perfect for the Summer, since I have frizzy dry hair and I do relaxers!